By Arlen Shahverdyan in Մշակույթներ / Cultures, Վայրի բնություն / Wildlife, Տարբեր / Various, Տեսանյութեր / Videos, Այլ կայքեր / Other websites, Բնապահպանական (Էկոլոգիական) / Environmental (Ecological), Գրքերս / My books, Իմ մտքերը / My Thoughts, Իմաստություն / Wisdom on May 5, 2016 . Congrats and I wish you all the best. Thank you so much! This book is the result of the last 11 years of my life. I hope this work will find a worthy attention. It sure will – just be calm and am sure you are going to be giving us like a intro right? Thank you so much for your inspiring and encouraging words, dear Kimberly! You comment is so positive! Much much appreciated! Book cover looks great simply challenges you to read. And I’m sure that the content of the book is very full of things wise and education. Have a wonderful evening and many blessings! Thank you so much my dear Stefani! I hope I’ll publish this book soon and will have the honor to introduce it to all of you! Thanks for your inspiring support! Thank you so much! I hope everything will be great! I can’t wait its publishing 🙂 The publishing of the book is like a child’s birth 🙂 Thank you for the positive message! Fantastic Arlen, congratulations, well done, you do have such talent. The picture on the top looks great! My dear Ute! Thank you so much! This book is very unique as it contains many of my thoughts, feelings. I can say even that this book is like a conversation between the author and his soul as well as the author and audience. I hope I’ll manage to find financial sources for its publishing. Wishing you god luck with it, Arlen! Thank you so much my dear! Your words give hope. Again and again I feel admiration. I am sure your work will be appreciated and the book is going to be popular with readers! Dear Anoush! Thank you so much for your inspiring comment, for your appreciation and encouraging words! You wrote a lovely response to my post! I hope that this book will be published soon. I try to do my best! Congratulations, Arlen! Will this book be published in English also? 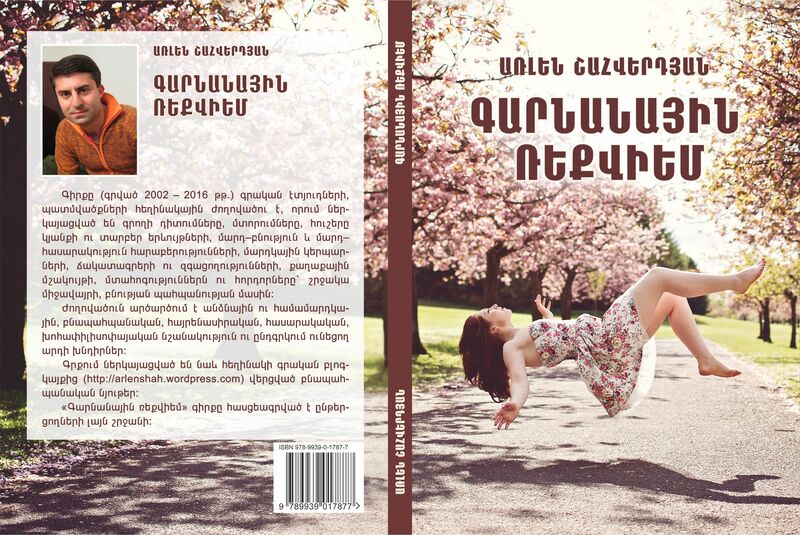 Unfortunately not, the book is in Armenian, but I was writing another book in English too. I hope I’ll publish that one too! That is truly beautiful, Arlen. Thank you so much dear Paula. You made my day! 🙂 A new day started, I am at work and it was a tremendous pleasure to open my blog and to see these lovely and inspiring words from you! Thank you! When people talk about souls…it’s really deep and moving. Wish you teh same, my tender and charming friend! Glad to hear from you again and thank you for your reply! Appreciated! Dear Khaula, unfortunately I have not publish it yet. I am looking now for the sponsor. I have finished the book, its cover, but a financial sponsorship is needed. Not a big ammount of money but a symbolic ammount: 250$ for 100 books. Thank you so much my dear! We talk about this on FB, but I would like to thank you again for your assistance, for your readiness for assistance. Thank you! Thank you so much mu dear Caroline! I am so glad you liked it. I hope you have watched the clip that I have made for this book. The “Spring Requiem” is a part from my soul and I am so happy to share it with my readers. Thank you again my tender friend!